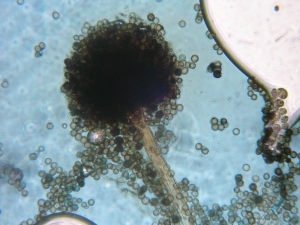 Aspergillus species related to Aspergillus niger (Aspergillus section Nigri) are important models for the study of eukaryotic protein secretion, the effects of various environmental factors on suppressing or triggering the export of diverse biomass degrading enzymes, molecular mechanisms critical to fermentation process development, and mechanisms involved in the control of fungal morphology. High quality genomic sequence of A. carbonarius will enable the application of high throughput global proteomics, reverse genetic studies of genes, and a variety of bioinformatic analyses in this important ascomycete. In addition, comparison of the A. carbonarius sequence to A. niger will be used to 1) improve gene model prediction and annotation, 2) discover conserved regulatory domains, 3) gain further insight into the taxonomy of Aspergillus section Nigri, and 4) elucidate the genetic basis for metabolic diversity between closely related species. Aspergillus carbonarius resembles A. niger in many features, and indeed the two species are very closely related. A. carbonarius differs from A. niger most notably in the production of larger spores, although other minor morphological differences exist. The available information on its physiology indicates a broad similarity to A. niger. Recently, black aspergilli, mainly Aspergillus carbonarius and members of the Aspergillus niger aggregate, have been described as a main possible sources of ochratoxin (OTA) contamination in grapes from Argentina and Brazil, France, Italy, Spain, Portugal, Greece and Australia as well as in dried vine fruits from different origins. Strong evidence of the contribution of A. carbonarius to the OTA contamination of wine has been also reported. Ochratoxin A is a highly harmful metabolite classified in 1993 by the International Agency for Research on Cancer (IARC, 1993) as a possible human carcinogenic toxin (group 2B).